After his education at the academies at Den Bosch and Antwerp, Jan Bogaerts initially painted dreamy figural pieces and fairytale parks and gardens in the manner of Symbolism. These early works show the influence of his Master Antoon van Welie. From around 1910, Bogaerts mainly concentrated on producing still lifes, both of fruits, flowers and objects. These are more realistic than his earlier landscapes, but equally enigmatic. For his compositions, Bogaerts used both everyday, and antique objects such as carpets, bottles, bowls, painted boxes and jewels, which he set against a sober background. His fruit and flower still lifes stand out because of their original composition and beautiful colors. Painted in 1912, the present work is one of Bogaerts’ earliest and finest still life interiors. 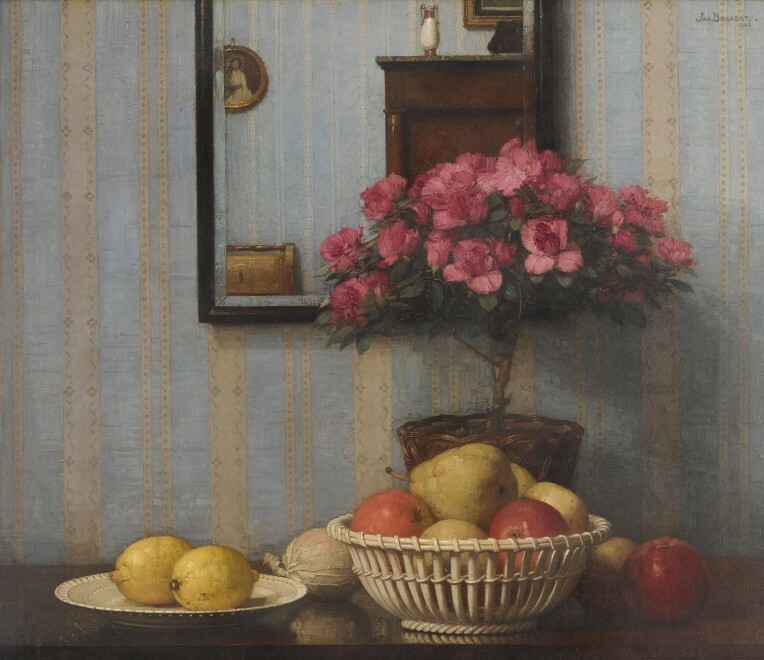 Reflecting his previous Symbolist compositions, Still Life with Azaleas captures the simplicity and mystery of his best paintings. This poetic piece projects a subdued, dream-like atmosphere and a sense of timelessness, which is further emphasized by the eccentric geometrics created by the mirrored reflection of the room’s wallpaper. Bogaert’s compositions are held in the permanent collections of the Gemeentemuseum at Arnhem, the Teylers Museum at Haarlem and the Noordbrabants Museum at Den Bosch.